San Diego Fire Capt. Steven Michaels testifies in an earlier, unrelated case. Image via CBS8 News. A veteran San Diego fire captain pleaded guilty Wednesday to a felony domestic violence charge for injuring his girlfriend during an argument. Steven Michaels, 54, faces up to a year in jail when he is sentenced Feb. 7. As part of his plea agreement, Michaels — a 30-year firefighter with San Diego Fire-Rescue — will be on probation for three years, said Deputy District Attorney Stephen Marquardt. Judge Timothy Walsh also ordered the defendant to have no contact with the victim, Marquardt said. At his arraignment in August, a prosecutor said Stevens shoved his girlfriend against a wall on July 21 and refused to let her use a cell phone to call for help after she was injured. Michaels has been arrested twice in the past for alleged domestic violence — once in 2006 and again in December 2015. 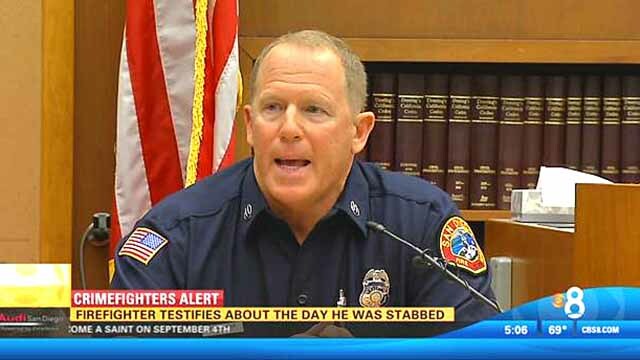 His run-ins with law enforcement were brought up during the trial of a man who stabbed two San Diego firefighters at an East Village trolley stop in June 2015. Defense attorney Gretchen von Helms didn’t immediately comment on how Stevens’ felony guilty plea will affect his job status.